Transportation Minister Yisrael Katz gave a stern warning to Israel Railways, while haredim continue to threaten to collapse the coalition. Transportation Minister Yisrael Katz (Likud) reprimanded Israel Railways CEO Boaz Tzafrir on Sunday for allowing camera crews and other non-essential personnel to work this past Shabbat at the Tel Aviv Hashalom train station. Minister Katz emphasized that the work crews violated the agreement reached on Friday between Prime Minister Binyamin Netanyahu and haredi politicians to only enact work on Shabbat which would be life threatening to passengers should it be done on weekdays. The haredi parties (UTJ and Shas) had previously threatened to withdraw from the coalition, effectively collapsing the government, if their demands were not met by sundown on Friday. Insider reports indicate Tzafrir promised Katz that a violation of the work agreement wouldn't happen again. Haredim, however, seem unconvinced. Chairman of the Knesset financial committee, MK Moshe Gafni (UTJ), verbally attacked Katz as a "liar" this morning, claiming he wanted to change the religious "status quo" when it came to shabbat. 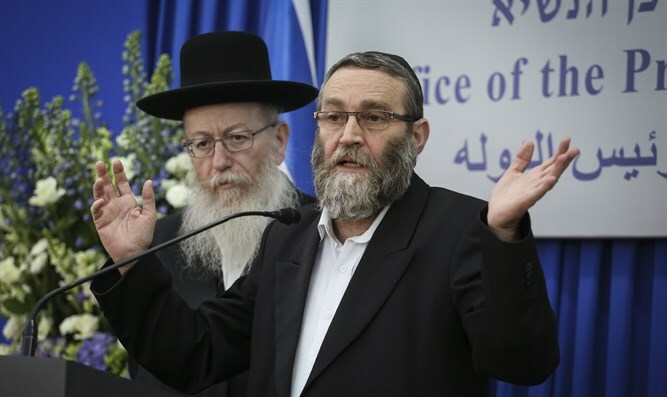 Gafni emphasized that if that is the intent - the haredim will leave the government. "We are heading toward a new status quo, which would allow people to work on Shabbat. If this is heading there - we won't be a part of it," Gafni said to Army Radio. Gafni accused Katz of bragging of not surrendering to the haredim. "We are obviously furious over the behavior of Yisrael Katz. Not only did he spit in the face of every keeper of Shabbat and traditions, he laughed."